Premier Rehydrant Spray - The LEAVE-ON Moisturizing Spray - is excellent for dry climates!! Premier Natural Botanical Pet Rehydrant Spray is used whenever you bathe or brush your dog, cat, puppy and even your horse. It's not silicone, it's a botanical spray that does not coat or damage your pet's skin and hair. 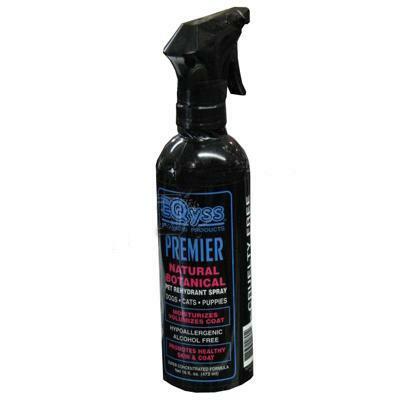 Premier Spray was developed specifically to bring moisture captured from the air to the coat at an accelerated rate over a long period of time (24 hours). If the hair is not coated with oil, moisture goes through the hair to the skin, and the skin respirates better. Premier Natural Botanical Pet Rehydrant Spray is not slippery and does not attract dirt and dust. It is non-toxic, hypoallergenic and its tearless formula won't burn the eyes. Conditions and moisturizes coat, prevents dry skin conditions and promotes healthy skin and coat. Enhances color while it detangles hair. Repels dust and dirt, and can be used on saddle area. And it's environmentally friendly!